First book down and check in. Still not feeling well but wanted to get first review done. It is 11:45 and I am headed to bed to hopefully get a fresh start in the morning. Leaving Gee's Bend was a book I really enjoyed. It had everything I love in a book. It had a character that at first glance seems weak and then shows how strong a character they are. It has the history part that I loved. To top all of this off they merged all of this with one of my favorite things, quilting. 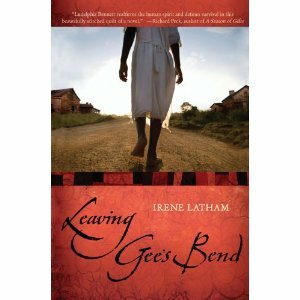 Leaving Gee's Bend is the story of Ludelphia Bennett, a ten year old black girl who must seek medical help for her mother. Her mother was pregnant and had been having terrible coughing fits. The baby comes early and Ludelphia with the help of her friend Etta Mae they deliver the baby. When Ludelphia's mother begins to cough up blood, Ludelphia decides to travel 40 miles out of Gees Bend to get a doctor for her mother. Little does she know that the help she finds there will be her towns saving grace. As Ludelphia is telling her story she is using the making of a quilt for her mother to help tell that story. As quilters we take every piece of fabric and we choose to place it where we do to tell a story, our own story. Ludelphia is able to tell her mother the story of her quilt after she is well. I had read several reviews that were not as enthusiastic as I felt about the book. I can only believe it is because maybe the reader was not a quilter who looked at the history of quilting and the stories they tell. I connected with this book because over the years I have taught the history of quilting in my classroom at school, used it to teach Geography and American History. I used it as projects to accompany novels we read. We've made baby quilts for pregnancy centers for community service. Maybe that is why this will have a prominent place on my shelves at school and will be another way I can pass on a love of quilting.